The Do-not-disturb mode in the LG G Pro 2 is named as the Quiet mode, and this comes pretty handy when you are off to sleep and don’t want to get disturbed by even the incoming calls and messages at that time. Of course when such functionality is available in a high-end device, there are options where you can make exceptions. 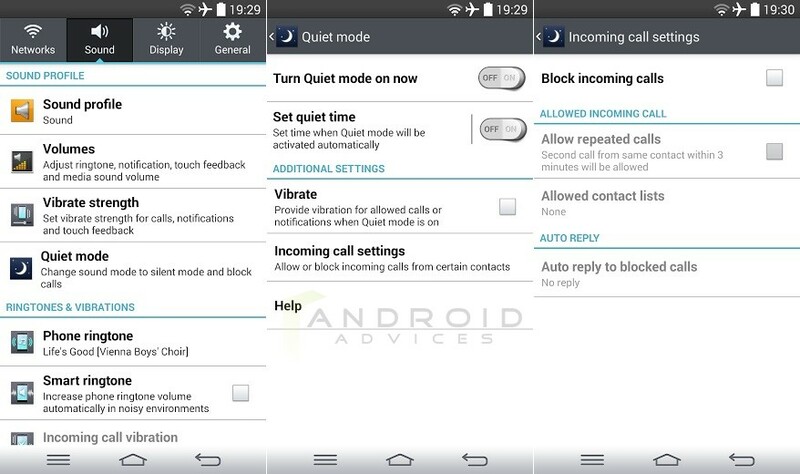 The Quiet Mode does the same, and you can have a few exceptions to receive the calls from selected contacts. 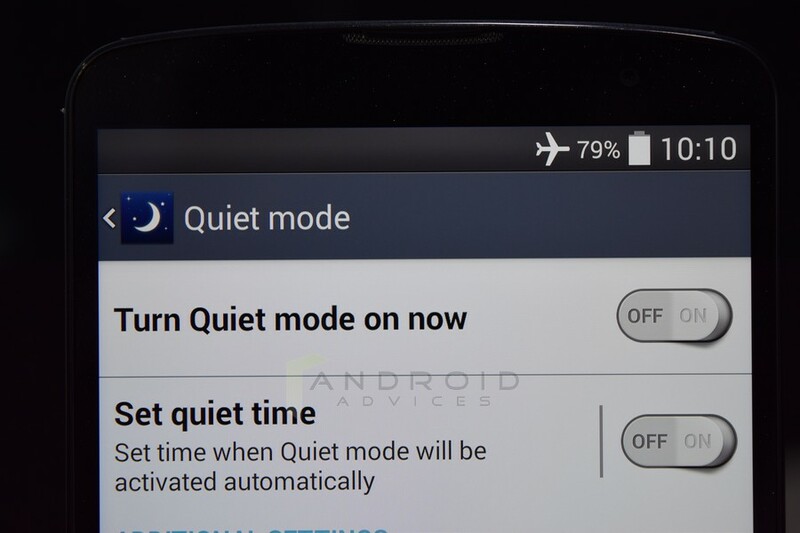 Now, the options that you get to play around with, in the Quiet mode are as follows. Set the quiet time: You can set the time when the quiet mode automatically activates and deactivates, so that you don’t have to manually do it if you are thinking to use this feature on daily basis. Toggle it On and then tap on the Time that shows on the left, to select the exact time and days during which you wish to have the quiet mode activated. For example, if you want to have no calls or messages from 11:00 p.m. to 7:00 a.m. from Monday to Friday, you can set that but there are no options for setting multiple times and different days, unlike what you see in Alarms and Reminders. Vibrate: Whether you need the phone to vibrate for the allowed calls, whenever the quiet mode is activated and you are received a call or notification. Incoming call settings: You can set to block all the incoming calls, and while doing that you can choose whether to allow repeated calls from the same contacts. Within a span of three minutes, if a particular contact is calling you thrice, you will receive those. There is an option to select the allowed contacts, only if you are blocking the calls. Auto Reply: If at all you are receiving calls from contacts and you have the Quiet mode activated, the phone can automatically send Auto reply to that contact. You can set the phone to not send any reply, or can set a custom message if you want the phone to send an SMS when a call is received. 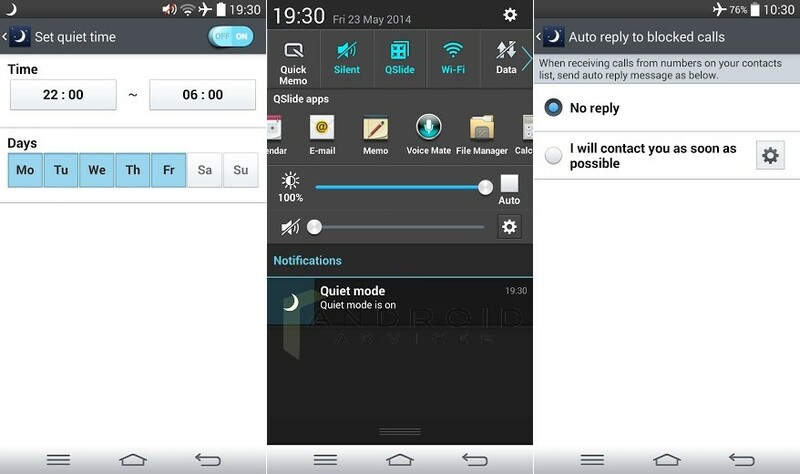 Overall, the Quiet mode is a very handy feature which comes to good use for those who have a hectic work life and wanted to have peaceful sleep at night, with no disturbance from the phone.